Here we go again. This week we ran the story of Lawrence Connelly, born in 1967 to a Canadian military family based in Germany, who found out this year that he cannot get a passport unless he can prove he’s a citizen — and the DND certificate of birth isn’t proof. 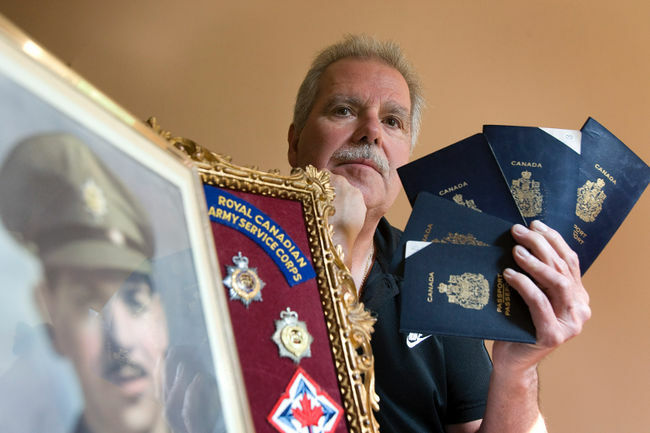 After reading the story, Paul Harman, born in 1952 to a Canadian army family based in Hamburg, Germany, realized he was in the same dilemma as Connelly — with an added wrinkle that made even less sense than Connelly’s Catch 22 situation. Now retired after running a retail sales company that provided jobs for over 20 individuals, Harman had a series of five passports issued to him over the years prior to new regulations imposed because of 9/11. The last time he applied for a passport renewal, Harman was rejected unless he could produce a Canadian birth certificate, which he didn’t have. The certificate of birth issued by DND in 1952 wasn’t good enough. He had to apply for a citizenship card as if he were a landed immigrant. “I’ve got to admit it really burned me to have to answer questions about my Canadian identity to an immigration person whose accent I could barely understand,” said Harman. “What I don’t understand — and no one has been able to explain it to me — is how I could have five Canadian passports over the years, renewed as they expired, and they still don’t accept that I’m Canadian.” Harman bowed to the inevitable stubbornness of the bureaucracy to accede to common sense, and applied for a citizenship card like a landed immigrant. Both Harman and Connelly wonder how many others are in the same situation as they. Army brats born out of Canada have no defence, most of them not realizing their never-land existence. If past Canadian passports are insufficient proof of citizenship, one wonders at the rigidity of the new system. If security is an issue — and it seems the only issue, misguided as it may be ­— common sense dictates that it’d be far easier to get a phony Canadian birth certificate than to acquire a National Defence certificate of birth. “Falling through the cracks,” is a fond term used by Citizenship and Immigration to justify their negligence or policies that exclude some Canadians from citizenship — be they children of military families born overseas, or war brides, or their children born before 1947. He’s achieved much, yet there are still an estimated 200,000 who have slipped through the cracks. In Harman’s case, he simply paid the required $85 to apply for the citizenship which was his birthright. “Yes, I felt like boat person having to prove my nationality,” he says. “Although there was no logic in it, I sucked it up and did what was demanded to get a passport. But it still isn’t right.” Will the government amend the passport rules? Unlikely. Don’t hold you breath.